Three blocks up Front Street from Joel B. Bryant’s bottling house and brewery stood another ale brewery, the Brandywine Brewery at 909 W. Front Street. A few doors down at #905, George Whitfield had operated a small brewery for just a few months in 1862, before he left to open a hotel on Delaware Street in New Castle. After the Civil War, Robert McCabe, John F. Miller and John J. Toner opened a vinegar manufacturing business under the name R. McCabe & Company. In October 1867, the firm re-organized with the same principal partners under the name Toner, Miller and Company. They re-tooled their plant, renaming it the Brandywine Brewery, and began brewing porter and ale. The firm recruited DeWitt M. Ogden from a Roxbury, Massachusetts brewery to work as its brewmaster. By ’69, Toner and Miller left the firm, which was then became known as D.M. Ogden & Company. That name too was short-lived. Ogden, a native New Yorker, departed the business in 1869 and moved to Philadelphia, eventually returning to Newburgh to work at the H. B. Ogden Brewery. McCabe continued on with the business, recycling the old R. McCabe & Company name, until the brewery finally closed for good in 1871. 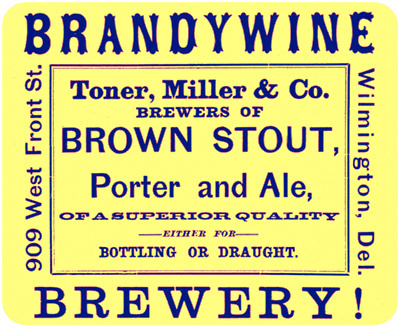 The Brandywine Brewery was an odd name for a brewery located only two blocks away from the Christina River, considering that the brewery was more than a dozen blocks west and south of the Brandywine River.